I’ve been too busy to write blog posts and I’m not sorry for that. Between work being hard and finding time for writing, blogging had to be cut. Even reading isn’t going at any fast rate, although I am really enjoying my current book far more than I thought I would. So I’m finally wrapping up the very last of my novella for the quarterly me and the guys are working on. Jonathan thought I was spot on when I explained that the act of making a synopsis robs the actual writing process of some of it’s enjoyment. Something about the act of creation, infusing ideas into words on the page. That’s where the majority of pleasure is in writing. Doing half the creativity in the synopsis does allow for a better paced and plotted story, but it’s no where near as fun as drafting from the hip. I’ve also been keeping my ear to the ground current events. The unfortunate passing of both Joan Rivers and Robin Williams (rest in peace, and you’ll both be missed), GamerGate, and the new Silent Hill game with Guillermo Del Toro, Hideo Kojima and Norman Reedus. That game alone has pretty much sold me on the PS4, but I’m waiting until October before I buy. I am very much looking forward to playing Destiny in the mean time between then and Silent Hill‘s release. Speaking of games of intrigue, the new Gauntlet really looks like fun. I’ve really been wanting a four player couch machine, and the fact that it can be played via both couch and online (combined if you want), puts it at the top of my to-get list. As far back as the Nintendo Entertainment System, I’ve had fun memories of Gauntlet. Me and my brother had a lot of fun trying various class combinations to stay alive as long as we can, as back their your health had a dual function as a timer, constantly ticking down. The more hits you took, the less time you had, hence the need for food all the time. See, I’ve forgotten how much I love couch video games with many friends. Co-op beats competitive for getting everyone to have fun together, and having everyone in the same room is just so much fun. It’s a shame that consoles have gradually moved away from this while… for some reason, PCs have had more indie titles that move towards it. Yeah, I don’t get this trend either. But four-players on the couch are why Mario Kart 8 has done so well. That, and it’s fun as all hell. A gallery of Cthulu art. This weekend, me and my friends are heading to Westport in Massachusetts. I’ve decided to bring this board game with me, Mansions of Madness. This game is built around H.P. 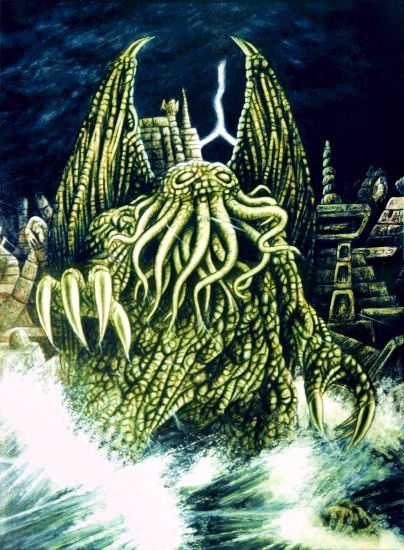 Lovecraft’s Cthulu mythos, an element that has an enduring quality… perhaps more so than Conan the Barbarian. The Cthulu mythos intrigues me as at least a portion of the writing is public domain, so it has subtly entered my cultural knowledge. Shub-Niggurath made an appearance at the very end of Quake. Alone in the Dark borrowed a few of the monsters, including Nightgaunts. In a peculiar way, Lovecraft’s work has become culturally ingrained in our understanding of horror, just as we make everyday references to Christian or Pagan concepts in our language, and may not even realize it. That’s half my excitement for Mansions of Madness. The other half is that the game walks a fine line between being a pen and paper role playing game and a regular board game. The Keeper, who has elements akin to a Dungeon Master, is also a player and has restrictions to hold his power in check. I could not simply have a dozen Shoggoths and wipe them out. But I have a most excellent array of abilities, ranging from conjuring a variety of monsters to hitting them with traumatic injuries both physical and psychological. I think this will be a weekend to remember.